By James L. Weiss, M.D. If you’re at risk for sudden cardiac death from a severe heart rhythm problem, an implantable cardioverter defibrillator could save your life. Yet not everyone at risk is a good candidate for such a device. Like an implantable cardioverter defibrillator, a wearable cardioverter defibrillator vest monitors your heart continuously. When it detects a life-threatening arrhythmia, the device delivers an electric shock to restore a healthy rhythm. Unlike an implantable cardioverter defibrillator, which is implanted under the skin near your chest, a wearable cardioverter defibrillator is placed outside your body. It doesn’t require invasive surgery, and it’s easy to put on and take off. How do I know if I need wearable defibrillator vest? • You’re waiting for an implantable defibrillator or a replacement, but surgery must be delayed for some reason, such as an infection that needs to be cleared before the procedure. • You have a newly diagnosed condition, such as heart muscle disease (cardiomyopathy) or you had a heart attack that might temporarily put you at heightened risk for sudden cardiac death. Your doctor can use a wearable cardioverter defibrillator vest as a “bridge” between therapies, typically lasting between 40 and 90 days, while monitoring your heart function to determine whether you need an implantable cardioverter defibrillator. • You have severe heart failure and are on an organ-transplant waiting list for a new heart. • You need time to gain a better understanding of your condition and the benefits and risks of permanent implantation. • Your third-party health insurer or Medicare may require you to undergo conservative treatment, usually 40 to 90 days after a diagnosis, before it will cover a permanent implantable cardioverter defibrillator, which can cost $30,000 or more. You may need to wear a wearable cardioverter defibrillator vest during this period. Currently, only one U.S. manufacturer has U.S. Food and Drug Administration approval to produce and market a wearable cardioverter defibrillator vest, branded the LifeVest. On its website the company states that the LifeVest is covered by most health insurance in the United States, including commercial, state, and federal plans, and offers a list of patient conditions and situations that are covered. The device consists of two parts: a vest and a battery powered defibrillator that you attach to a belt around your waist or strap over your shoulder. Inside the vest are four electrodes around your chest that monitor your heart rhythm and three electrodes that provide defibrillation if you need it. If you have an unusually fast heartbeat (ventricular tachycardia) or an erratic, out-of-control rhythm (ventricular fibrillation), the device will vibrate against your skin and sound a tone to alert you. You’ll respond by pressing two buttons to signal that you’re conscious and don’t need defibrillation. If you don’t press the buttons, the device assumes you’re unconscious and that the arrhythmia it detected may be lethal. 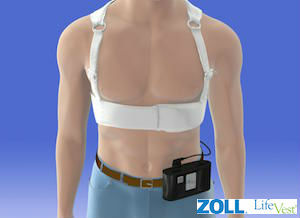 It releases a gel over the electrodes that will then deliver a shock through your chest within one minute. If the first shock doesn’t succeed in bringing your heartbeat back to normal, LifeVest will deliver another one—up to five shocks in total. The wearable defibrillator is made up of a lightweight vest and a monitor. You wear the vest against your skin underneath your clothes. Two straps containing the electrodes wrap and fasten around your chest. The monitor fits into a holster on your belt or attaches to a shoulder strap. You wear your defibrillator all day, but you must remove it—albeit briefly—to shower or bathe. Your doctor will custom fit the defibrillator vest to ensure its electrodes press against your chest firmly enough to detect heart rhythm changes, but not so tightly that they trigger false alarms. If you’re extremely overweight, your doctor might be unable to fit the device correctly. It’s critical that you wear the defibrillator vest just as your doctor instructed so it works properly in an emergency. The biggest benefit of a defibrillator vest is that it could save your life. A study in the March 2017 JACC: Clinical Electrophysiology found that 94 percent of people who received a wearable cardioverter defibrillator shock for ventricular tachycardia or ventricular fibrillation survived. Survival rates are similar to those of an implantable cardioverter defibrillator. The device can also transmit information about your heart rhythm to your doctor to help guide your treatment. Discomfort is one potential downside to wearing a defibrillator vest. Up to one in five people who try a device stop using it because of issues like skin rash, itching, and sleep disturbances. And though a shock could save your life, it’s painful enough to make your health-related quality of life suffer. It can also leave you with skin burns. Although a defibrillator vest doesn’t involve surgery, it still needs careful consideration. There isn’t enough evidence yet from clinical studies to confirm its advantages and safety profile. The American Heart Association recommends having a thorough discussion with your cardiologist about your risks and potential benefits before moving forward. Stephanie Watson has written about consumer health for nearly two decades. Her work has been featured in such publications as WebMD Magazine, Healthline, Harvard Health Publications, and Arthritis Today.